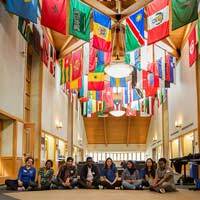 An interactive Global Game Day event will bring international Students and American students together in Sunnen Lounge on April 6, between 3-5 p.m. Global Game Day is collaboration between the Society of International Languages and Cultures, English as a Second Language, the Japanese Student Association, the Center for International Education, and the International Student Association. Meet new people, laugh about language differences, find things in common, and have fun with the planned activities. Students, faculty and staff are welcome to attend.